3. Amazing Video Movie Game Experience, turn your smartphone into a virtual reality viewer. Giant Screen Experience, this Eye-Opener able to let you Fly through the Grand Canyon, play 3D games, travel the city streets of Paris or become a character in an animated /fun /exciting film. A truly fun and immersive experience for any age. 1. Firstly, turn your smart phone bluetooth switch on, then press the "Start "button of the RC for 2 Seconds, a red light appeared it will soon turn into flahing light for bluetooth pairing and connecting. 2. Choose KEY Mode / GAME Mode as needed. 3. Built to last sturdy & User-Friendly Model, comes with Illustrated Manual for reference. 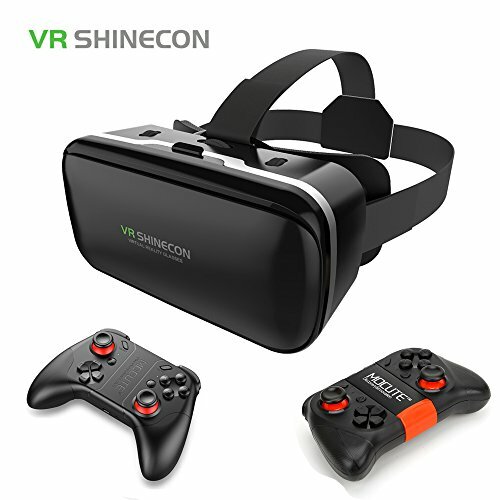 2017 Newest Upgraded Shinecon 6.0 VR Headset - with ergonomic head strap, wide angle view, enhanced high quality glasses can filter blue light, reduce the eye fatigue.